The Guild’s re-vamped “art + framing today” has today dropped through my letter box and makes an excellent read. A+FT is the phoenix rising from the ashes of ABT; whilst the structure and balance is similar to that of ABT its content has been re-organised to balance equally that of business, art and framing subjects. Its change of name acknowledges the importance to the Guild of its framing community along with the commitment to providing the very best in framing education, qualification and the importance of Continuing Professional Development. The framing section contains two outstanding articles along details of how to use one’s GCF to boost business and the latest Read, Reflect and Learn(RRL) on Lightfastness and the Blue Wool Scale. 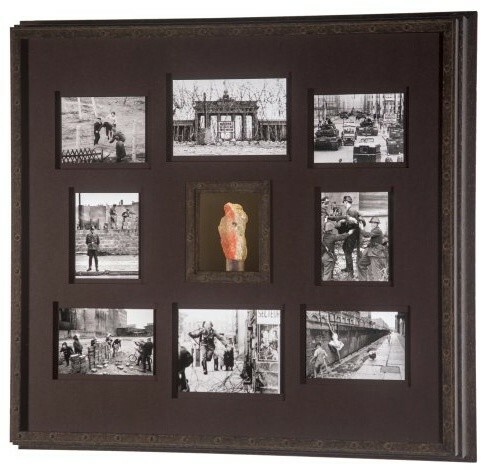 Of the two articles; John Ranes II CPF, GCF writes on how he framed a piece of the Berlin Wall and for those who have read March’s PFM(page 10 - Industry News) will realise this won the first prize and popular choice in the open category at this year’s PPFA’s International Framing Competition. The second is by Aidan Lynch GCF(APF) of Dublin University on the subject ‘The dark side of light’ explains how environmental factors such as UV light and high humidity can damage framed artwork irreparably. The RRL article featured is the eleventh in this series of educational articles aimed at providing those GCF(APF) with the means to collect CPD credits. It's a "like", and it's good to note the request for ideas of improvement, that gives us the opportunity to shape the magazine going forward. The three sections of Art, Business and Framing are all very readable - even if like me your appreciation of art is limited. For those of you who don't receive the Art + Framing Today from the FATG, you can order this individual April issue from the Guild offices as Mal suggested - - 020 7381 6616. The article also appeared in the April issue of Der Kunstandel auf Deutsch, and is slated to appear in the November issue of Picture Framing Magazine. The project was really fun to execute and part of what made it exciting was that unlike most projects in our shop where I might be involved in the design and not much more, this project, I actually completed from conception to completion, myself! As one might realise after following the link above the said article is not in this issue. The only place, at present, that one might read the full article written by John is in the last issue of A+ FT. The announcement of winners was in the March Issue of PFM. Do you have a link to the current issue ? Sorry, no we don't at the moment, however as mentioned if you are desperate, you can order a single copy of Art + Framing Today from the Guild office. I used to read art business today through a phone app I used, issue, with a little jiggery pokerey you could get the latest edition up, I don't think the newly launched mag is on there though. Thanks for the link to the PPFA magazine, some very interesting stuff. Obviously, the businesses and organizations that publish magazines are in the biz to stay profitable...or at least pay their bills. So it doesn't surprise me that the FATG provides a FREE online sample copy of an older issue of ABT while the current issue of A+FT needs to be obtained through subscription or ordering an individual copy. If this were your business, you would protect its assets and property! Picture Framing Magazine where my article will appear in the November 2016 issue does offer a similar thing... They actually have a website loaded with previous articles that are downloadable but only with a paid subscription. I have always subscribed to the rags of our trade: Decor Magazine when it was still in print, Profile from Australia and the others named above. You just can't get too much information! My link above is to the current issue of PFM, although this isn't something that has always been/will always be, available. It used to be possible to get Art Business Today back issues on line for free, everything but the current issue I think; if you still can, I can't find it, maybe it changed when they changed the name to AFT ?? The name was changed to Art + Framing Today, not AFT, and at the moment it's not available for free online, as per John Ranes II CPF GCF comments above. Thank you John for a considered post. Well to be honest John AFT is all ready an abbreviation for something quite different, as in AFT you got a pint in it also is used for rear end or the back, so you really do need to get these things right.